While leprosy is often considered a disease of the past, the bacterial infection continues to wreak havoc in many countries. Partners of a new clinical trial, led by the Institute of Tropical Medicine Antwerp (ITM) and funded by the European & Developing Countries Clinical Trials Partnership (EDCTP), will test different methods of preventive treatment to stop the disease in the Comoros and Madagascar, two of the most affected countries. “Despite sustained control efforts, the Comoros and Madagascar continue to struggle with many cases of leprosy. We want to find out which preventive treatment approach is most effective to stop the debilitating disease in its tracks,” said Prof Bouke de Jong of ITM who is heading the study. The Comoros is reporting one the highest prevalence rates worldwide with 3,3 registered cases per 10.000 people. For Madagascar this figure is 0,84. However, the study results will also serve the 150 countries worldwide where patients are affected by leprosy. In the PEOPLE project (Post ExpOsure Prophylaxis for LEprosy in the Comoros and Madagascar), villages on the Comoros and in Madagascar will be randomly assigned to one of four study arms. The villages will then be screened on a yearly basis for four consecutive years. Depending on which of the four arms a village is assigned to, people in the surroundings of a leprosy patient will or will not be offered Post-Exposure Prophylaxis (PEP) using the antibiotic rifampicin. The WHO recently recommended to offer preventive treatment to contacts of leprosy patients. The new guidelines are largely based on the COLEP study, in which around 20.000 contacts in Bangladesh received one dose of the rifampicin or a placebo. While the effect of the antibiotic to lower the number of new leprosy cases was clearly demonstrated, it is not yet clear which contacts (household or social) will benefit from the prophylaxis. In the PEOPLE study, 144.000 contacts will be assigned to four different arms, where, depending on the arm, the double of a standard dose rifampicine will be offered, after the contacts’ informed consent. In arm 1, no preventive treatment is given. In arm two, only members of the same household of the leprosy patient will be offered preventive treatment. In arm three, every person living in a radius of 100 meters around a confirmed leprosy patient will be offered treatment. In arm four, this applies to every person in the same radius who tests positive in fingerstick blood for antibodies against M. leprae, indicating infection with the bacterium causing leprosy. Partners met in Antwerp early October to plan the main trial, as well as anthropological sub-studies on the acceptability of the interventions, implementation of an antibody field test and molecular sub-studies in which the bacteria are ‘fingerprinted’ to identify routes of transmission. 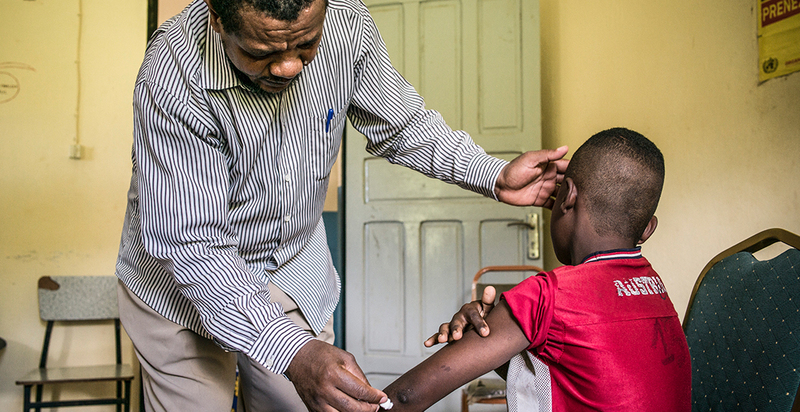 Recruitment of patients at the sites managed by the National Leprosy Control Programmes and supported by the Damien Foundation and Fondation Raoul Follereau, will start 1 January 2019.